This weekend was our annual Home County Festival of Art and Music (formerly Home County Folk Festival), and we were treated to music from some truly awesome musicians like Kathleen Edwards and the Joel Plaskett Emergency. There were also the usual craft and food booths, amongst which were some old favourites, who show up year after year. One of these is the booth for Daniel Pollak Accessories. It's easy to spot in the sea of little white tents as it glitters when the sun hits it. 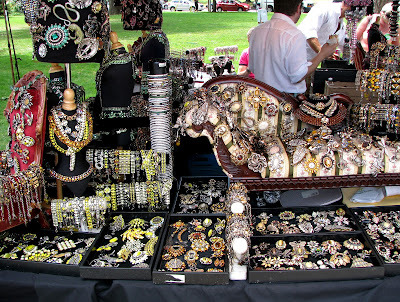 His entire booth is packed with large vintage-style brooches, necklaces, and bracelets in all shapes and colours. It's overwhelming for the unitiated - I remember the first time I found his booth years ago, I was transfixed by the sheer amount of bold bling, and must have spent close to an hour in an attempt to look at all the pieces, which are organized by colour. 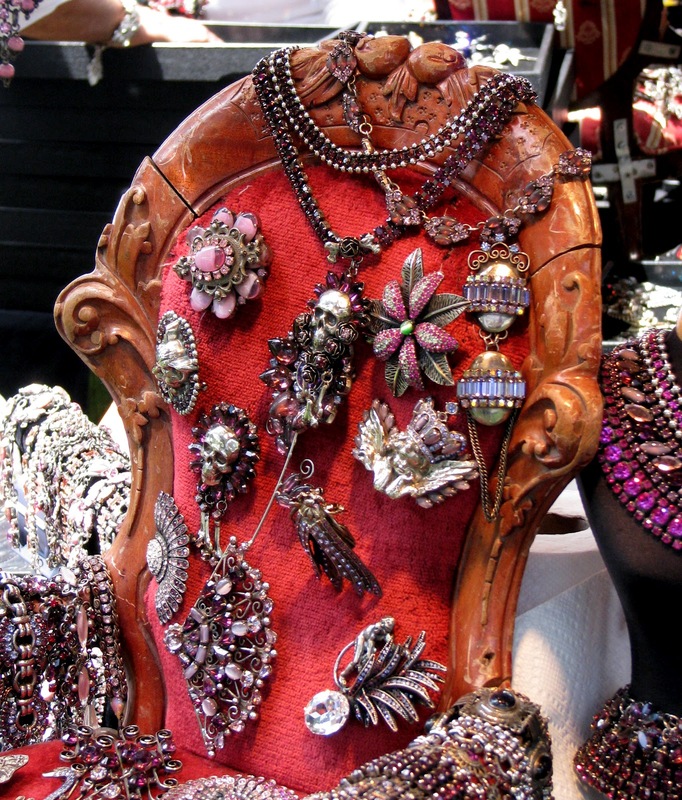 At the time I first saw his booth, I really wanted to own one of the pieces, but they are relatively expensive, and as time went by, my taste gradually moved away from oversized jewelled brooches to simpler statement pieces in sterling silver or leather. That doesn't mean that I still don't enjoy browsing through the riot of sparkly colours. Mr. Daniel Pollak himself, modelling some of his own bling. I heard him tell a customer that he will do weekend festivals right up until Christmas Eve. He has quite a collection! Is this how he supports himself full time? Looks like wonderful times were had. I love going to events like these and shopping. When you get a sec, please check out my new blog and follow me! Have a lovely day! I'm the same re: the glittery brooches, but they're lovely to look at. And to see and hear Kathleen Edwards perform? Pure heaven; she's one of my faves. So very beautiful! 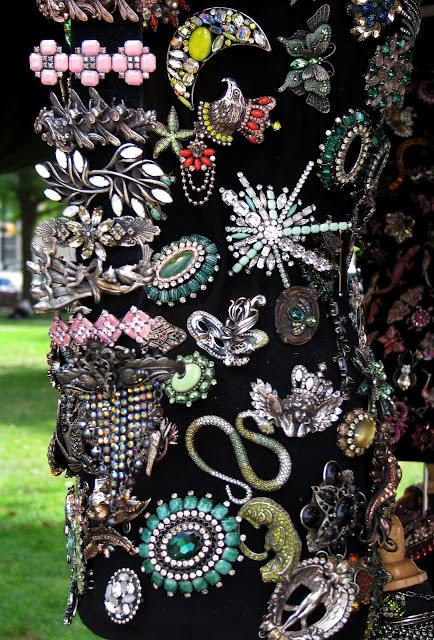 I love vintage brooches so this was fun. I like how he displays his collection. Great organizing ideas. Danny is a true artist! His pieces are amazing! He is a fabulous person! Strives to hell each customer and has stories of each place he has traveled! He is a remarkable human being!! 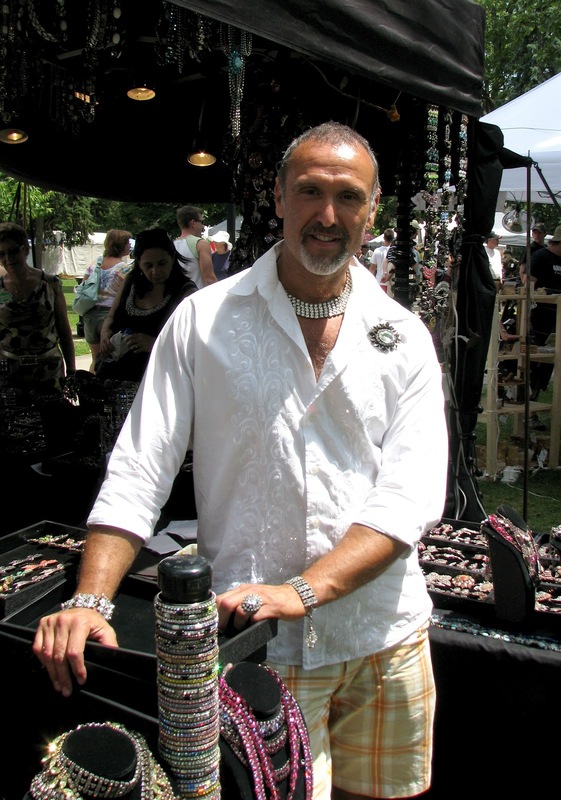 Love Love Love his Jewelry and him!